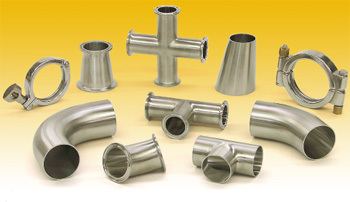 Top Line clamp fittings are a fast, sanitary, secure solution to your process piping requirements. These fittings are offered in type 304 or 316L stainless steel and are available in polished finishes that meet or exceed 3A standards. Choose from 1″ through 12″ diameters. We also offer gaskets for your clamp fittings in a variety of FDA approved materials, including Buna N, EPDM, Teflon and more. Top Line precision crafted clamp fittings provide fast, sanitary and secure connections. Polished fittings come standard with the No. 7 ID/OD finish (180 grit -32Ra ID/OD) finish which meets or exceeds FDA and 3A regulatory standards.